Donation Coder is a site where people give ideas and developers develop them. It’s a very good way of innovation because if one person has an idea and can’t program it into a software, donation coder is the way to go. I like donation coder softwares as they are free and are very handy in my daily work. Today I found a tool on donation coder which is like a normal software updater and it updates the installed softwares from donation coder. Flipbook Printer is a program that lets you make your own printed “Flipbooks” from avi movie files using business cards. LaunchBar Commander is what is commonly referred to as an “Application Launcher”; it is typically docked to the side of your screen and lets you configure buttons and menus which will launch your favorites programs. Process Tamer is a tiny (140k) and super efficient utility for Microsoft Windows XP/2K/NT/Vista that runs in your system tray and constantly monitors the cpu usage of other processes. When it sees a process that is overloading your cpu, it reduces the priority of that process temporarily, until its cpu usage returns to a reasonable level. Screenshot Captor is a program for taking screenshots on your computer. Unicode Image Maker is a program for international users that lets you create images from text, especially Unicode or Nonstandard Font Text. 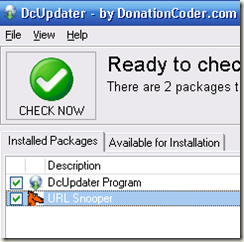 I use URL Snooper for capturing direct download links of different softwares and multimedia files so that I can download directly from my download manager. And at the end, you can download DCUpdater to download all these softwares in one go and then update them automatically by this sweet lil utility.